Fifty-seven years after the first running club was officially founded, new running tribes are popping up all over, with different agendas but the same desire to connect. 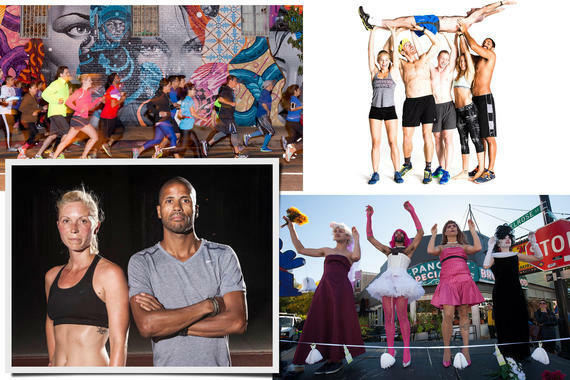 Just a few of running's many tribes: BlacklistLA, the November Project, Frontrunners, and the Black Roses (clockwise from top left). Photographs by Alex Aristei, Guido Vitti, Ralph Childs, and Emiliano Granado. Lately I've been listening to podcasts during long runs -- fascinating stories that make the miles sail by. One of my favorites is Invisibilia, which explores human behavior and the unseen ideas, emotions, and assumptions that affect our lives. An episode called "The Power of Categories" focused on our primal need to sort ourselves into social groups we identify with or aspire to. The hosts made the case that life is harder when you have no category, and that finding one -- surrounding yourself with people who are like you in some key way -- makes you feel that you are not only significant, but enduringly so. I was three miles into a good, sweaty run when I started listening to it, and because great audio stories penetrate your brain in a very evocative way, I got to thinking about runners. After all, we're a category. When the first running boom went off in the 1970s, simply being a runner set you apart. Runners were a tribe -- a few thousand skinny guys running sub-three marathons and training 90 miles per week in what looked like underwear -- but a tribe nonetheless. From then on, the world was divided into two kinds of people: runners and non-runners. It said so in the bible (or at least in The Runner's Bible, published in 1985). We began waving knowingly to other runners. We wore race jackets and running shoes at all hours. We wondered why more people didn't get off the couch! Today, though, there are 42 million runners in the U.S. About half are women, and it seems like everyone has run a marathon. You could argue that because our category is so much larger, we have a better chance of forging the enduring significance we crave. While that may be true, we are actually organizing our tribes more tightly, especially in big cities. We are creating subcategories -- running clubs, groups, and "collectives" that are highly social (fueled, yes, by social media) and narrowly defined around identity, race, time goals, and other idiosyncrasies. So much for the loneliness of the long-distance runner. Running clubs are not new, of course. The first to register with the Road Runners Club of America was the New York Road Runners, in 1958, with 29 members. It now has 60,000 members, and in the past 10 years, RRCA-member clubs across the country have grown from 660 to 1,095 -- which does not include informal grassroots tribes growing just as quickly. Ever since profiling November Project (now in 26 cities) in December 2013, we've followed this trend closely, and have recently featured running tribes from all over with all manner of niches, whether it's art (BlacklistLA, July), Sunday repasts (bRUNch Running, August), or sexual orientation (Frontrunners, October). Knox Robinson, who appears on our November cover, cofounded Black Roses NYC in 2013. He wanted to take an approach, he says, "like you'd find at a training camp in Kenya or Portland, Oregon," and to welcome men and women, black, white, or otherwise, "so we can really learn from each other." But what separates the Black Roses from other tribes is that it's "based in the greatest city on the planet, and we are exploring, celebrating, and sharing that culture with the world." Robinson sees lots of other new groups in New York and elsewhere. "All these crews," he says, "are paving the way for a true third running boom." I hope all these tribes continue to come together, and I suspect they will. The most powerful feeling I get at races -- from gigantic marathons to Firecracker 5Ks -- is the sense of being among people who feel much the way I feel about life, and who are about to embark on the same challenge. There are no strangers on the starting line, just fellow runners who haven't met yet.